A helicopter is an aircraft that is lifted and propelled by one or more horizontal rotors, each rotor consisting of two or more rotor blades. Helicopters are classified as rotorcraft or rotary-wing aircraft to distinguish them from fixed-wing aircraft because the helicopter derives its source of lift from the rotor blades rotating around a mast. The word 'helicopter' is adapted from the French hélicoptère, coined by Gustave de Ponton d'Amecourt in 1861. It is linked to the Greek words helix/helik- (Template:Polytonic) = "spiral" or "turning" and pteron (Template:Polytonic) = "wing". As an aircraft, the primary advantages of the helicopter are due to the rotor blades that revolve through the air, providing lift without requiring the aircraft to move forward. This creates the ability for the helicopter to take off and land vertically without the need for runways. For this reason, helicopters are often used in congested or isolated areas where fixed-wing aircraft are not able to take off or land. The lift from the rotor also allows the helicopter to hover in one area and to do so more efficiently than other forms of vertical takeoff and landing (VTOL) aircraft, allowing it to accomplish tasks that fixed-wing aircraft are unable to perform. Leonardo da Vinci conceived a machine that could be described as an "aerial screw". He wrote that he made small flying models  but could not stop the rotor from making the whole craft rotate. Later machines would more closely resemble the ancient bamboo flying top, with spinning wings rather than screws. From 1860 to 1880, many small helicopter models were designed and made. These included Alphonse Pénaud's model coaxial rotors, powered by twisted rubber bands (1870). Enrico Forlanini's unmanned helicopter was powered by a steam engine. It was the first of its type that rose to a height of 13 meters, where it remained for some 20 seconds, after a vertical take-off from a park in Milan (1877). Emmanuel Dieuaide's design featured counter-rotating rotors and was steam-powered through a hose from a boiler on the ground (1877). Melikoff designed a "man carrier," but it was almost certainly not built (1877). Dandrieux's design had counter-rotating rotors and a 7.7-pound (3.5-kilogram) steam engine. It rose more than 40 feet (12 m) and flew for 20 seconds (circa 1878). In the 1880s, Thomas Edison experimented with small helicopter models in the USA. First he used a guncotton-powered engine, but it caused damage by explosions, and tests were ended. Next he used an electric motor. His tests showed that a large rotor with low blade area was needed. That same year, fellow French inventor Paul Cornu designed and built a helicopter that used two 20-foot (6 m) counter-rotating rotors driven by a 24 hp (18-kW) Antoinette engine. On 13 November 1907, it lifted its inventor to 1 foot (0.3 m) and remained aloft for 20 seconds. Even though this flight did not surpass the flight of the Gyroplane No. 1, it was the first truly free flight with a pilot. Cornu's helicopter would complete a few more flights and achieve a height of nearly 6.5 feet (2 m), but it proved to be unstable and was abandoned. In the early 1920s, Argentine Raúl Pateras Pescara, while working in Europe, demonstrated one of the first successful applications of cyclic pitch. Coaxial, contra-rotating, biplane rotors could be warped to cyclically increase and decrease the lift they produced; and the rotor hub also could, allowing the aircraft lateral movement without a separate propeller to push or pull it. Pescara is also demonstrated the principle of autorotation, by which helicopters safely land after engine failure; by January of 1924, Pescara's helicopter No. 3 could fly for up ten minutes. Yet, in 1921, the aviation visionary Giulio Douhet ridiculed the thought of a "plane capable of remaining immovable in midair" as "absurd". One of Pescara's contemporaries, Frenchman Etienne Oemichen, set the first helicopter world record recognized by the Fédération Aéronautique Internationale (FAI) on 14 April 1924, flying his helicopter 360 meters (1,181 ft). On 18 April 1924, Pescara beat Oemichen's record, flying for a distance of 736 m (nearly a half mile) in 4 minutes and 11 seconds (about 8 mph, 13 km/h) maintaining a height of six feet (2 m). Not to be outdone, Oemichen reclaimed the world record on 4 May when he flew his No. 2 machine again for a 14-minute flight covering 5,550 feet (1.05 mi, 1.692 km) while climbing to a height of 50 feet (15 m). Oemichen also set the 1-km closed-circuit record at 7 minutes 40 seconds. Meanwhile, Juan de la Cierva was developing the first practical rotorcraft in Spain. In 1923, the aircraft that would become the basis for the modern helicopter rotor began to take shape in the form of an autogyro, Cierva's C.4. Cierva had discovered aerodynamic and structural deficiencies in his early designs that could cause his autogyros to flip over after takeoff. The flapping hinges that Cierva designed for the C.4 allowed the rotor to develop lift equally on the left and right halves of the rotor disk. A crash in 1927 led to the development of a drag hinge to relieve further stress on the rotor from its flapping motion. These two developments allowed for a stable rotor system, not only in a hover, but in forward flight. At this same time, in the Soviet Union, the aeronautical engineers Boris N. Yuriev and Alexei M. Cheremukhin, working at TsAGI, constructed and flew the TsAGI 1-EA single rotor helicopter, which used an open tubing framework, a four blade main rotor, and twin sets (one set of two each at the nose and tail) of 1.8 m (6 ft) diameter anti-torque rotors. Powered by two M-2 powerplants, themselves up-rated Soviet copies of the Gnome Monosoupape rotary radial engine of World War I, the TsAGI 1-EA made several successful low altitude flights, and by August 14, 1932 Cheremukhin managed to get the 1-EA up to an unofficial altitude of 605 meters (1985 ft), shattering d'Ascanio's earlier achievement. As the Soviet Union was not yet a member of the FAI, however, Cheremukhin's record remained unrecognized. Nicolas Florine, a Russian engineer, built the first twin tandem rotor machine to perform a free flight. It flew in Sint-Genesius-Rode, at the Laboratoire Aérotechnique de Belgique (now von Karman Institute) in April 1933 and attained an altitude of 6m and an endurance of 8 minutes. Florine chose a co-rotating configuration because the gyroscopic stability of the rotors would not cancel. Therefore the rotors had to be tilted slightly in opposite directions to counter torque. Using hingeless rotors and co-rotation also minimised the stress on the hull. At the time, it was probably the most stable helicopter in existence. In the United States, Igor Sikorsky and W. Lawrence LePage, were competing to produce the United States military's first helicopter. Prior to the war, LePage had received the patent rights to develop helicopters patterned after the Fw 61, and built the XR-1. Meanwhile, Sikorsky had settled on a simpler, single rotor design, the VS-300. After experimenting with configurations to counteract the torque produced by the single main rotor, he settled on a single, smaller rotor mounted vertically on the tailboom. As LePage and Sikorsky were building their helicopters for the military, Bell Aircraft hired Arthur Young to help build a helicopter using Young's semi-rigid, teetering-blade rotor design, which used a weighted stabilizing bar. The subsequent Model 30 helicopter demonstrated the simplicity and ease of the design. The Model 30 was developed into the Bell 47, which became the first aircraft certificated for civilian use in the United States. Produced in several countries, the Bell 47 would become the most popular helicopter model for nearly 30 years. Military forces use attack helicopters to conduct aerial attacks on ground targets. Such helicopters are mounted with missile launchers and miniguns. Transport helicopters are used to ferry troops and supplies where the lack of an airstrip would make transport via fixed-wing aircraft impossible. The use of transport helicopters to deliver troops as an attack force on an objective is referred to as Air Assault. Unmanned Aerial Systems (UAS) helicopter systems of varying sizes are being developed by companies for military reconnaissance and surveillance duties. Naval forces also use helicopters equipped with dipping sonar for antisubmarine warfare, since they can operate from small ships. With a single main rotor helicopter, the creation of torque as the engine turns the rotor creates a torque effect that causes the body of the helicopter to turn in the opposite direction of the rotor. To eliminate this effect, some sort of antitorque control must be used, with a sufficient margin of power available to allow the helicopter to maintain its heading and provide yaw control. The three most common controls used today are the traditional tail rotor, Eurocopter's Fenestron (also called a fantail), and MD Helicopters' NOTAR. The tail rotor is a smaller rotor mounted vertically or near-vertical on the tail of a traditional single-rotor helicopter. The tail rotor either pushes or pulls against the tail to counter the torque. The tail rotor drive system consists of a drive shaft powered from the main transmission and a gearbox mounted at the end of the tail boom. The drive shaft may consist of one long shaft or a series of shorter shafts connected at both ends with flexible couplings. The flexible couplings allow the drive shaft to flex with the tail boom. The gearbox at the end of the tailboom provides an angled drive for the tail rotor and may also include gearing to adjust the output to the optimum rotational speed typically measured in rotations per minute (RPM) for the tail rotor. On some larger helicopters, intermediate gearboxes are used to transition the tail rotor drive shaft from along the tailboom or tailcone to the top of the tail rotor pylon, which also serves as a vertical stabilizing airfoil to alleviate the power requirement for the tail rotor in forward flight. It may also serve to provide limited antitorque within certain airspeed ranges in the event that the tail rotor or the tail rotor flight controls fail. NOTAR, an acronym for NO TAil Rotor, is a helicopter anti-torque system that eliminates the use of the tail rotor on a helicopter. Although the concept took some time to refine, the NOTAR system is simple in theory and works to provide antitorque the same way a wing develops lift using the Coandă effect. A variable pitch fan is enclosed in the aft fuselage section immediately forward of the tail boom and driven by the main rotor transmission. This fan forces low pressure air through two slots on the right side of the tailboom, causing the downwash from the main rotor to hug the tailboom, producing lift, and thus a measure of antitorque proportional to the amount of airflow from the rotorwash. This is augmented by a direct jet thruster (which also provides directional yaw control) and vertical stabilizers. Counterrotating rotors, are rotorcraft configurations with a pair or more of large horizontal rotors turning in opposite directions to counteract the effects of torque on the aircraft without relying on an antitorque tail rotor. This allows the power normally required to drive the tail rotor to be applied to the main rotors, increasing the aircraft's lifting capacity. Primarily, there are three common configurations that use the counterrotating effect to benefit the rotorcraft. Tandem rotors are two rotors with one mounted behind the other. Coaxial rotors are two rotors that are mounted one above the other with the same axis. Intermeshing rotors are two rotors that are mounted close to each other at a sufficient angle to allow the rotors to intermesh over the top of the aircraft. Another configuration found on tiltrotors and some earlier helicopters is called transverse rotors where the pair of rotors are mounted at each end of wing-type structures or outriggers. Coaxial rotors are a pair of rotors turning in opposite directions on the same masthead. The advantage of the coaxial rotor is that, in forward flight, the lift provided by the advancing halves of each rotor compensates for the retreating half of the other, eliminating one of the key effects of dissymmetry of lift: retreating blade stall. However, other design considerations plague coaxial rotors. There is an increased mechanical complexity of the rotor system because it requires linkages and swashplates for two rotor systems. Add that each rotor system needs to be turned in opposite directions means that the mast itself is more complex, and provisions for making pitch changes to the upper rotor system must pass through the lower rotor system. Transverse rotors are mounted on the end of wings or outriggers, perpendicular to the body of the aircraft. Similar to tandem rotors and intermeshing rotors, the transverse rotor also uses differential collective pitch. But like the intermeshing rotors, the transverse rotors use the concept for changes in the roll attitude of the rotorcraft. This configuration is found on two of the first viable helicopters, the Focke-Wulf Fw 61 and the Focke-Achgelis Fa 223, as well as the world's largest helicopter ever built, the Mil Mi-12. It is also the configuration found on tiltrotors, such as Bell's XV-15 and the newer V-22 Osprey. Modern rotor systems may use the combined principles of the rotor systems mentioned above. Some rotor hubs incorporate a flexible hub, which allows for blade bending (flexing) without the need for bearings or hinges. These systems, called "flextures", are usually constructed from composite material. Elastomeric bearings may also be used in place of conventional roller bearings. Elastomeric bearings are bearings constructed from a rubber type material and have limited movement that is perfectly suited for helicopter applications. Flextures and elastomeric bearings require no lubrication and, therefore, require less maintenance. They also absorb vibration, which means less fatigue and longer service life for the helicopter components. A helicopter has four flight control inputs. These are the cyclic, the collective, the anti-torque pedals, and the throttle. The cyclic control is usually located between the pilot's legs and is commonly called the cyclic stick or just cyclic. On most helicopters, the cyclic is similar to a joystick. 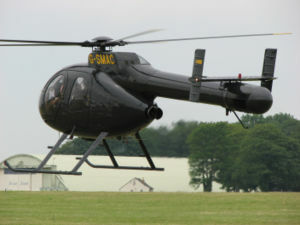 Although, the Robinson R22 and R44 have a unique teetering bar cyclic control system and a few helicopters have a cyclic control that descends into the cockpit from overhead. This article has been tagged since June 2008. The Rotomotion SR20 is a small, unmanned helicopter which is powered by electric batteries. The SR20 can carry a payload of 10 pounds for 12 to 24 minutes based on battery configuration. Template:Unreferencedsection The main limitation of the helicopter is its slow speed. There are several reasons why a helicopter cannot fly as fast as a fixed wing aircraft. When the helicopter is at rest, the outer tips of the rotor travel at a speed determined by the length of the blade and the RPM. In a moving helicopter, however, the speed of the blades relative to the air depends on the speed of the helicopter as well as on their rotational velocity. The airspeed of the advancing rotor blade is much higher than that of the helicopter itself. It is possible for this blade to exceed the speed of sound, and thus produce vastly increased drag and vibration. See Wave drag. Settling with power, also known as a vortex ring state, is essentially when the aircraft settles into its own downwash, unable to climb out of the condition due to the effect of the turbulent air on the aerodynamics of the rotor. Ground resonance (affects helicopters with rotor systems having lead-lag natural frequency less than the blade rotation frequency). Khankala attack - Mi-26 shot down over Chechnya in 2002; 127 killed. 1997 Israeli helicopter disaster - MH-53 crash in Israel in 1997; 73 killed. 1977 Israeli CH-53 crash - CH-53 crash near Yitav in the Jordan Valley on 10 May 1977; 54 killed. 1986 Sumburgh disaster - a British International Helicopters Boeing 234LR Commercial Chinook, Shetland Islands; 45 killed. 1968 Los Angeles Airways Flight 417 - a Los Angeles Airways Sikorsky S-61L crashed enroute to the Disneyland Heliport; 21 killed. ↑ Hirschberg, Michael J. and David K. Dailey. , "Sikorsky." US and Russian Helicopter Development In the 20th Century. American Helicopter Society, International. 7 July 2000. ↑ Goebel, Greg. "The Invention Of The Helicopter". Vectorsite.net. Retrieved: 28 November 2007. ↑ Fay, John. "Helicopter Pioneers - Evolution of Rotary Wing Aircraft". Helicopter History Site. Retrieved: 28 November 2007. ↑ English, Dave, ed. "Predictions", Great Aviation Quotes. Skygod.com. Retrieved: 9 December 2007. ↑ "Leonardo Da Vinci's Helical Air Screw". Pilotfriend.com. Retrieved: 28 November 2007. ↑ 10.0 10.1 10.2 10.3 10.4 "Early Helicopter Technology". Centennial of Flight Commission. Retrieved: 9 December 2007. ↑ "Pioneers - 1900/1930". Helicopter History Site. Retrieved: 3 May 2007. ↑ Douhet, Giulio (1983). The Command of the Air. Washington: Office of Air Force History. ISBN 0912799102. ↑ 13.0 13.1 Rumerman, Judy. "Helicopter Development in the Early Twentieth Century". Centennial of Flight Commission. Retrieved: 28 November 2007. ↑ 14.0 14.1 "The Contributions of the Autogyro". Centennial of Flight Commission. Retrieved: 28 November 2007. ↑ Watkinson, John "Art of the Helicopter", pp. 358 Published by Butterworth-Heinemann in 28 January 2004. ↑ Day, Dwight A. "Igor Sikorsky - VS 300". Centennial of Flight Commission. Retrieved: 9 December 2007. ↑ Connor, R.D. and R.E. Lee. "Kaman K-225". Smithsonian National Air and Space Museum. 27 July 2001. Retrieved: 9 December 2007. ↑ Alpman, Emre and Long, Lyle N. "Understanding Ducted-Rotor Antitorque and Directional Control: Characteristics Part II: Unsteady Simulations." Journal of Aircraft Vol. 41, No. 6, November–December 2004. ↑ 22.0 22.1 Frawley 2003, p. 151. ↑ "NOTAR Fleet Marks 500,000 Flight Hours". American Helicopter Society. Retrieved: 25 February 2007. ↑ "The Boeing Logbook: 1983-1987". Boeing.com. Retrieved: 25 February 2007. ↑ "Lockheed CL-475". Smithsonian National Air & Space Museum. Retrieved: 10 March 2007. ↑ Cox, Taylor. "Blades and Lift". Helis.com. Retrieved: 10 March 2007. It uses material from the Wikipedia article "Helicopter". This page was last edited on 7 August 2008, at 22:49.